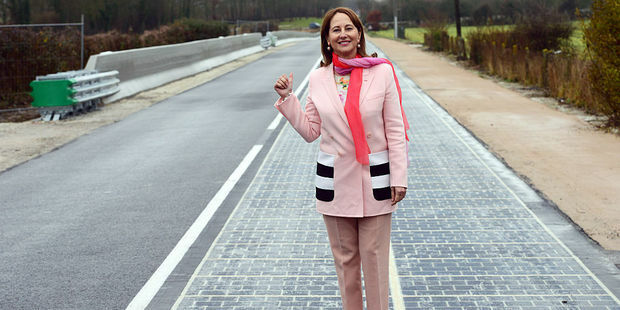 World first solar panel roadway opens in French town. The Normandy town of Tourouvre has opened the world’s first solar roadway, bringing the hugely popular idea into reality. The notion of paving roadways with solar panels to meet our energy needs is very appealing, but for the longest time it has remained largely a theoretical one. The newly launched French roadway is just one kilometre long but that works out to be 2800 square metres of photovoltaic cells – enough, theoretically, to power the village’s street lights. The resin-coated solar panels were hooked up to the local power grid just in time for Christmas as France’s Environment Minister Segolene Royal looked on last week. One day such technology could revolutionise roadways, energy infrastructure and even how cars work and interact with the road. Previous PostDr Jarrod Gilbert: Bill English faces tough job shifting the ‘lock ’em up’ penal policyNext PostMaking the connection between work and dignity – Noah Smith.